In the previous post, we talked about the benefits of having good quality letterhead and notecards in your marketing toolbox. Even if your business can’t afford high-end, professionally printed pieces, as long as the paper is decent and everything looks like your brand, it’s better to at least have something! This month, it’s all about Media Kits. - an “About” piece that gives some information on the company, like how long it’s been in operation, who the key players are, what the company does, etc. - a “Process” piece that explains how your company works should a customer decide to do business with you. A design firm might create a flowchart or break down the design process into steps so it makes sense to a layperson. It would outline where and when the initial meeting would happen, how payment takes place, when revisions are submitted, when the cabinets and appliances are installed, and etc. - a “Testimonials” piece with praise and comments from past clients. This is very important, as consumers are far more likely to make a decision on a purchase based on the opinions and feedback of fellow buyers. - a “Gallery” piece displaying examples of your work; for business owners in creatively-driven fields like the arts or design, potential customers want to see photos of products and projects! Pictures of a finished kitchen, examples of colorful tile or photos of tile as part of a finished space are far more appealing than just blocks of text. - a “Press Release” that talks about something new with your business. People (especially the media) are always looking for a newsworthy story or angle to write about. Even if your press release isn’t picked up by the media, it’s good to have in a Media Kit because it’s a great vehicle to announce something new and exciting to potential customers. In marketing-speak, Media Kits are also referred to as Press Kits, Informational Packets, or something similar. They have many names, but serve the same purpose. Media Kits are great to have on-hand if you’re out on sales calls, meeting with a potential client, exhibiting at a trade show or to actually send to the news media to let them know who you are. The above contents we listed don’t necessarily have to be in your Media Kit, but most or all probably should be in some form. Since we preach brand identity and consistency, we recommend simply printing Media Kit pieces on letterhead if that’s what your budget allows for. The most important thing is that you’re consistent. Keep using your logo, brand colors and fonts over and over and over. If you don’t have the time or budget to get fancy, elaborate containers for your media kit pieces, a simple folder or large envelope will do the trick! If you have a rubber stamp with your logo or some simple stickers made up, you can easily make plain folders your own. Lastly, be sure it’s easy to contact you. Ideally, every piece in the Media Kit should have your address, phone number, e-mail address and website address (if applicable) listed, so if the pieces get separated someone can still get a hold of you without too much effort. Don’t forget to include a business card! What comes to mind when you think of Coca Cola? Thanks to Coke’s extensive and ever-present marketing campaigns, you probably think of words like refreshing, ice cold, American, family gatherings and fun to name a few. You probably associate positive feelings with the Coke brand. Thinking about it makes you feel good. A brand or product identity is the sum of the attributes one associates with a brand- and by extension, the branded company, organization, product or service. An effective brand builds a connection between the brand personality as it’s perceived by its audience and the actual product or service. Coke is a perfect example of a strong brand identity. They count on you calling to mind these positive associations when you’re in the soda aisle at the supermarket. Though Coca Cola’s marketing is constantly evolving, with new commercials and logo updates, their brand identity has remained consistent decade after decade. Every tagline and every jingle and every upbeat commercial you’ve ever seen and ever will see stays true to Coke’s message and brand. They have built a solid brand identity. A logo is one of the most important components of a brand identity. Three things are important when considering whether or not a logo is “strong”: Color, Shape and Frequency. Haute Kitchens, one of the brand identities created by Trebuchet, serves as an excellent strong example. Color: The color of a logo is of the utmost importance. Color speaks volumes about your brand and is a very strong element in a brand’s identity. When choosing color(s) for a logo, you must consider people’s associations with those colors and how that will translate to their associations with your brand. Red is powerful and commands attention-some of the most recognizable brands in the world (Coca Cola, Target) use the simple combination of red and white to make you stop and take notice. Green is calming, refreshing and symbolizes growth and wellbeing. It’s often used by companies in the health and wellness industry for this reason. Purple brings to mind wealth, luxury and sophistication. Centuries ago, it was used to denote royalty and thus is still associated with status and majesty. Point being: the color of your logo speaks volumes about your company and products or services. What do you want yours to say? Haute Kitchens wanted to exude elegance with a bit of an Asian feel to reflect the owner’s heritage. 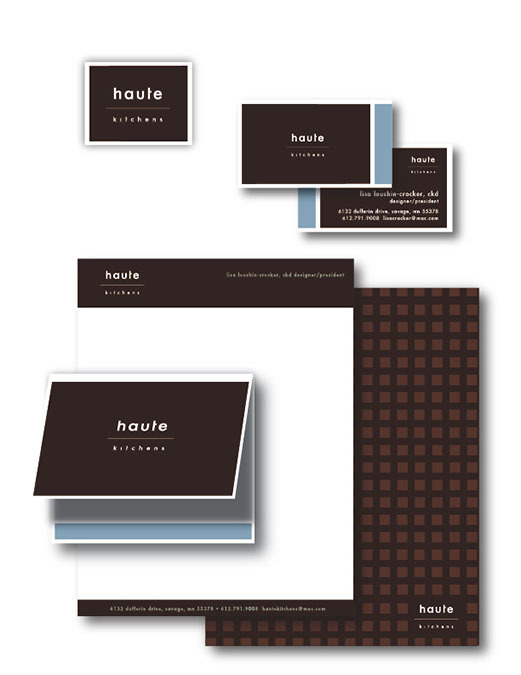 Deep, rich browns accented by a pale blue make her marketing materials feel earthy and calming. Shape: Like color, shape is also an important part of a logo and brand identity. The shape of the font(s) and of other elements in the logo should be consistent with the type of product you sell or the service you provide. A construction company’s logo will likely be very angular and linear with a strong font that brings to mind stability and quality. On the other hand, a women’s spa would probably use a very fluid, serif-style font with embellishments and soft curves to inspire feelings of calm and serenity. The font chosen for Haute Kitchens is reminiscent of the designer’s clean, modern aesthetic. Since Haute doesn’t have a design element as part of their logo, the square pattern as seen on the back of the letterhead becomes their signature “shape.” The angular, square-shaped pattern is repeated wherever possible. Frequency: Think back to the Coca Cola example discussed in the beginning. The Coke brand has been around for decades. Yet every piece of advertising they create utilizes the exact same script “Coca Cola,” the same color of red and the same themes: happiness, optimism, All-American and togetherness. They tweak their taglines and their jingles, but the core elements of the brand remain the same. That’s how brand identities are built and how they become strong. Business owners mistakenly believe they must constantly change their look to keep their customers interested. Wrong! Every time you communicate with your audience you’re hoping to gain their trust (and their dollar). You want to essentially keep repeating yourself. It’s putting equity in your brand!